Audio-Technica’s 2000 Series is a 10-channel frequency-agile UHF wireless system designed to suit a variety of applications, including MI/live performance, fixed installation, public address, A/V rental houses and places of worship. It offers all the advantages of a high-quality, professional wireless system at an extremely affordable price. Features switchable antenna power. Also, the optional ATW-CHG2 two-bay recharging station provides power to recharge NiMH batteries in two ATW-T220a handheld transmitters and/or ATW-T210a UniPak® transmitters in any combination. 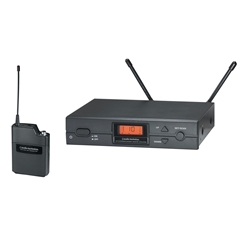 ATW-R2100b receiver and ATW-T210a UniPak® transmitter. Select a Wireless Essentials® microphone or cable to complete the system.